In August 2016, the plant “Lotos” in the Astrakhan region has started the construction of the first native cruise liner, in the past 60 years. It is planned to construct two more analogous ships, following the scheme PV300. The new native motor-ship, which is being constructed at the dock of the “Lotos” plant, would have the maritime class “river-sea” and the 5* level of comfort. 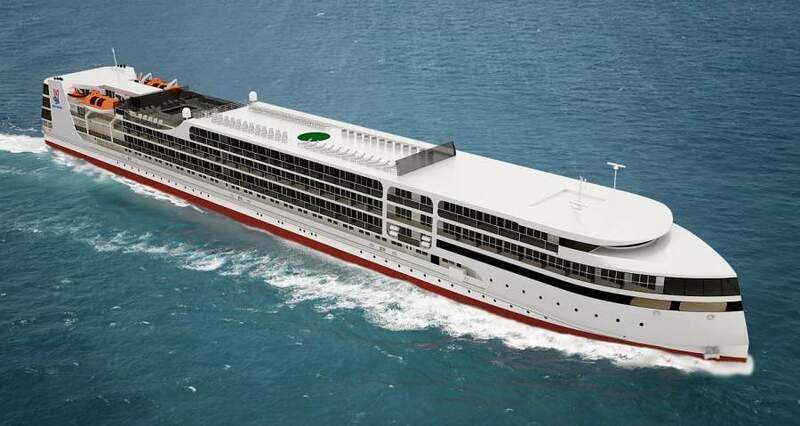 The main characteristics of this cruise ship are: length 141 meters, width 16.8 meters, capacity 300 passengers. The River Shipping Company of Moscow (the RSCM) and its affiliated company “Mosturflot” took part in development of the technical plan of the ship. The “Mosturflot” will become the first company to operate the new cruise ship. It is planned to complete the new ship by 2018 and hand it over to the new owner by April 2019. The ship supposed to navigate along the popular route St. Petersburg – Moscow, and during the time when navigation is no longer possible, it should be forwarded to the Black and Caspian Sea. Nonetheless, there is no precise plan regarding the navigation routes for the PV300. For its development, the senior managers of the RSCM are planning to visit the maritime terminals in the port-cities of Black and Caspian seas and negotiate with local port-managers and tour agencies. In the end of 2016th, the “Vodohod” cruise company has signed the contract with the “Joint Shipbuilding Corporation” (JSC) for construction of the cruise ship PV300. The construction contractor of the project PV300 will be the ship construction plant PJSC “Krasnoe Sormovo” in Nizhniy Novgorod. The new liner is planned to be ready for the navigation season 2020. The project realized by the “Vodohod” company resembles the ship project PV300 only partly, as it was modified to meet the company’s standards of commercial efficiency. The full name of the project carried out by the “Vodohod” is PV300LMPP-110. The new ship is planned to navigate between Moscow and St. Petersburg, with navigation duration up to 5 or more months. Moreover, the future operator has increased the carrying capacity of the ship, which would be able to accommodate up to 342 people. The average size of the standard cabin will be 19 sq. m. For comparison, the current average size of the cabins on other cruise ships equals to 10 sq. m. The cabins on the new liner would still have balconies, nevertheless the amount of Suites and Junior Suites (approx. 30 sq. m.) was reduced. “Vodohod” expects the new cruise ship to be of interest for both foreign and Russian customers. This project is targeting those people who have never considered the river cruises as a possible mean of recreation, due to the lack of the ships with an appropriate comfort level.